The Classic Flyer by Kettler 12" Retro Trike with Adjustable Seat: Candy Apple Red is a great tricycle for those just beginning to ride. This trike combines the classic retro look with modern innovation and safety technologies. The trike features a 12" front wheel and 7" rear wheels. The rubber tires and steel spoke wheels ensure a smooth ride and a great, classic look. The turn radius of the tricycle has been limited to help prevent tipping. The rear dual deck and wide, slip-resistant foot pedals make this tricycle a safe and comfortable ride. With its classic chrome handlebars that are equipped with a ringing bell and rubberized handgrips with streamers, this tricycle is equipped for a stylish rider. The up and down adjustable seat allows your children to adjust the height of the bike seat to suit them as they grow. The durable, high-carbon steel frame ensures durability. 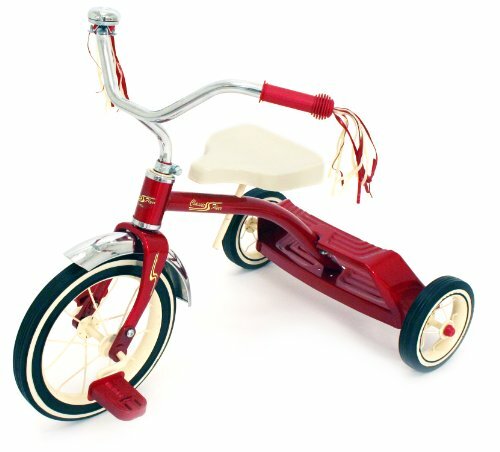 The Classic Flyer by Kettler 12" Retro Trike with Adjustable Seat: Candy Apple Red is recommended for children between the ages of one and a half and four years old.